Birds always keep life interesting, even in the heart of winter. I reported recently that common redpolls were moving farther south this winter and that amateur naturalists should keep an eye on their bird-feeders. In some areas, the redpolls are not only sticking around at feeding stations offering black oil sunflower or Nyjer thistle, but their flocks are growing in size. My friend and fellow birder Ben “Beast Mode Birding” Douglas has been working on his State Park Big Year (trying to see as many birds in a year as he can in Minnesota state parks). 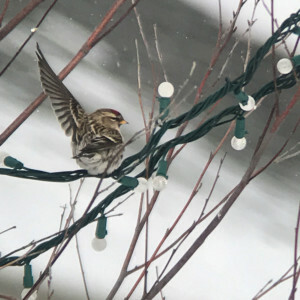 He got some really great yard birds when some common redpolls showed up in his backyard, and he was fortunate enough to get the frostier-looking hoary redpoll in his yard, too. Then he posted some interesting behavioral observations the birds engaged in when temperatures dropped and snow fell. The redpolls were making holes in the snow. I had read that redpolls will tunnel in snow to stay warm, but I’d never witnessed the behavior. This week, Ben posted photos of redpolls in the morning using holes they’d made on his neighbor’s roof, just coming out from roosting. I went to his home to check it out. He lives in a newer housing edition with few trees. Almost every roof with snow in his neighborhood had evidence of redpoll holes. The birds changed their preferred holes based on the wind so they could avoid a drafty sleep. 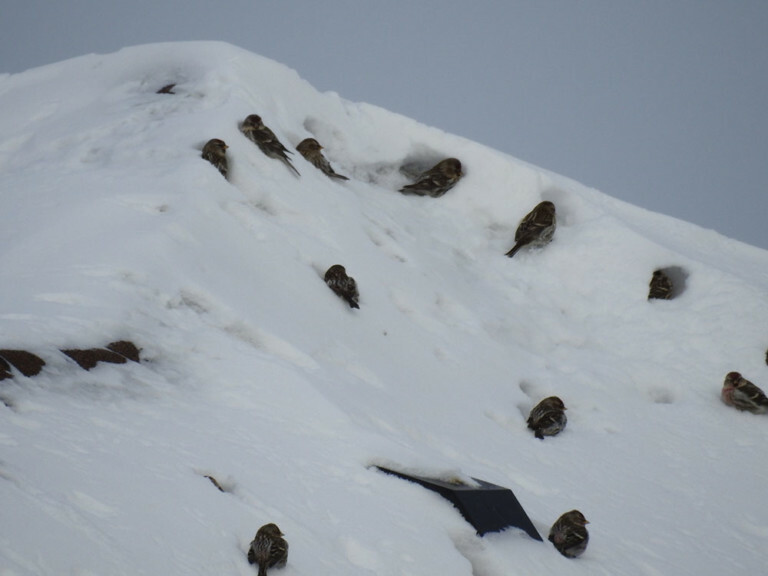 Redpolls aren’t the only birds to use snow as an insulator. Gray partridge will do this as well, but as they are burrowing in snow on the ground, they find that, not only is snow a good insulator at night, it also provides access to seed underneath. Redpolls using roofs for their tunnels can use the peaks as wind breaks, and – by being higher up – are less at risk of being discovered by a cat or coyote wandering the scent trails. Birds use all kinds of strategies to stay warm. Cavity nesting species will use nest boxes and woodpecker holes to roost in at night. Some species, like Eastern bluebirds, will share a cavity, using communal body heat for additional warmth. Many birds use thick conifers as protection from the wind when they sleep, and I’ve even see mourning doves roost near dryer vents for heat. There is always something interesting to find in bird behavior. If you see redpoll flocks in your neighborhood, watch for their tunneling activity.